While they have different capacities and features, the best Yamaha generators are all of exceptionally high quality. This is what the brand is famous for and it has always kept its reputation. You can be sure that your new generator will perform exactly as promised by the manufacturer. The company is also among the industry leaders in terms of innovation. Most of their models use inverter technology, which keeps the total harmonic distortion down to the very possible minimum to deliver what is known as clean power – power without surges. This enables the generators to safely power devices which are sensitive to surges. These include all gadgets with microprocessors from desktop computers to smartphones. 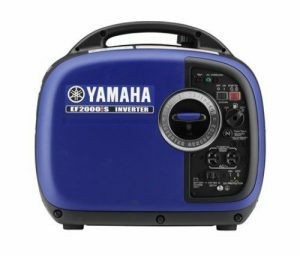 When you are shopping around and comparing the best Yamaha generators presented here, you should consider their capacity to produce power in the first place. You would certainly need a bigger and more powerful unit to use as backup in your house while you can go for something compact and easy to carry around if you want to use electricity when you go camping. 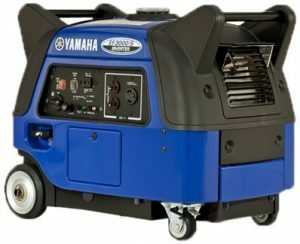 What Are The Top Yamaha Generators You Should Consider? You should look closely at the features which each model offers to decide if it meets your individual requirements. Let’s get started now. Undoubtedly, the number one question is how much power this one of the best Yamaha generators can deliver. It makes 2000 watts of surge power and 1600 watts of power continuously. This makes it a good choice for camping, outdoor sports and tool powering, especially given its compact size. It could also work as a backup generator or for running the AC system of an RV, especially when paired with a unit of the same model. You just have to connect the two units with a cable, which is not included in the package however. OHV engine with cast iron cylinder liner – You don’t have to worry about overheating, but simply enjoy the smooth operation. The engine boasts with great durability. Controller for advanced programming – Because of it, you can power a wide variety of appliances. 1 120V AC outlets and 1 DC 8A 12V outlet for battery charging – This is pretty reasonable given the unit’s size and capacity. Smart Throttle – It works to regulate the engine speed based on load, making the Yamaha EF2000iSv2 generator more energy-efficient and quieter. Runtime of 10.5 hours at 1/4 load – This is awesome for such a small unit. Auto decompression and auto warm-up features – These make starting the generator easier, regardless of the weather. Gasoline petcock – It helps to avoid carburetor issues due to stale gas. Fuel gauge – It makes it easy to tell when you need to add fuel. The rated noise level is 61 dB at standard load and 51.5 dB at 1/4 load – This one of the best Yamaha generators can easily be described as quiet. This device produces 3000 watts of starting power and 2800 watts of continuous power. You can use it as backup when there is a blackout to power some lamps and a few appliances. It is one of the best portable generators, also suitable for running the air conditioner of RVs too. Yamaha EF3000iS is not among the smallest models in the brand’s range with its dimensions of 27 by 22 by 18 inches, but it comes with four wheels and two handles so it’s easy to move around. There’s even a parking brake, but you’d expect that from one of the best Yamaha generators. 171cc four-stroke single cylinder OHV engine with air cooling – This is a state-of-the-art engine which won’t fail you now and in the long term. 2 standard AC outlets and 1 DC outlet for battery charging – These should be sufficient based on the unit’s capacity. Smart Throttle – By controlling the speed of the engine, this feature helps to bring down fuel consumption and noise. 19 hours of runtime at 1/4 load – This is quite an achievement given the capacity of Yamaha EF3000iS. Independent gas petcock – Eliminates the stale gas in the carburetor to protect it. Noise block system – It uses specially designed material to reduce the vibration and noise produced by the engine. 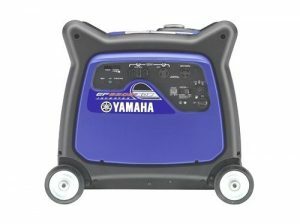 The noise production level at full load is 60 dB and at 1/4 load 53 dB – This one of the best Yamaha generators is among the quietest you will find in general. If your main goal is to get backup power for your house, then this one of the best Yamaha generators could be the right one for you. It makes 6300 watts of starting power and 5500 watts of continuous power. You can easily keep the lights and fridge in your home on, use a heater or a fan and cook food at the same time. Additionally, this model uses a Pulse Width Modulation inverter system which guarantees power free of surges so you can confidently run and/or charge all sensitive electronic devices that you have including your laptop and smartphone. With its dimensions of 29.5 by 33.3 by 28.5 inches, Yamaha EF6300iSDE is big and heavy too, but comes with four equally large wheels so you can pull it or push it conveniently into the required directly without having to make turns. This is certainly a clever solution. 357cc four-stroke single cylinder air-cooled OHV engine – It won’t fail you for sure and this is what you’d expect from one of the best Yamaha generators. Smart Throttle – It leads to greater fuel efficiency and less noise by regulating the engine’s speed. 3 hours of runtime at 1/4 load – This is not great given the large capacity of the model. Electric start – Just push the button and Yamaha EF6300iSDE will start running. Dual voltage 120/240V – You can run a larger number of appliances and tools because of it. Power meter – It makes it easy to track how much of the generator’s capacity you use. Hour meter and fuel level gauge – They help you pinpoint refueling times. Noise block system – Special design helping to bring noise levels down further. Noise level rated at 64 dB at full load and at 58 dB at 1/4 load – This is pretty good.